This is a sticky thread for the best tours and itineraries added to the Itineraries and trip planning category. Please let us know if you see a good itinerary, question or other thread and we'll add it to this list. I'm a new member so not sure how to do this. I'd like to find out the practicalities of towing a touring caravan to the Outer Hebrides - probably doing the Calmac island Hopscotch - can anyone point me in the right direction to find out more? Planning on setting off mid to late August. Hi @TrashWomble - you might want to start by taking a look at our Island Hopping guide here, which covers a lot of the basics. Each of the major islands in the Outer Hebrides also has its own website with details of campgrounds and driving on the islands. Hopefully some other members have done this and can chime in with specific recommendations! Hi @visitscotlanddave, I am bringing my family to Scotland for our annual holiday in just over 10 days time. We've visited Edinburgh before and are staying there for 1 night before arriving in fort William where we have hired a cottage. We will travel via Glasgow as we want to visit there but we are a bit overwhelmed about all the rings to do during our weeks stay in fort William. I happy to do driving to explore but need any help you can give in suggesting must do things to put on our itinerary. My kids are 10 and 13. Perhaps you could start a new discussion or question on this and I'm sure you will get some replies and recommendations. Hi everyone! I've just released an article on my personal blog explaining the itinerary I did a few weeks ago... all by public transport! Castle lodging near a golf course of good quality. We will be considering doing the 3 Day Highland Itinerary on your website. We will be starting our time in Scotland in Edinburgh and then travel the itinerary you mention...we would like to stay after this trip at a castle convenient to our location that would be near a well known golf course to play a round before heading back to Edinburgh to fly back to the states... Could you recommend something for us? Hi @Goody when are you travelling over? New member looking for some advice. I am planning a trip for 2-3 weeks in September (2017). I will be with my parents who are in their 80's, and they are unable to walk great distances. Thinking of renting a flat in Glasgow or Edinburgh and then making day trips out with some possible overnights. Really don't think I want to rent a car. Should we put our base in Glasgow or Edinburgh? Will the trains take us to most of the highlights? Any suggestions will be greatly appreciated. Being based in either city would be fine. You could even split your time between Edinburgh, Glasgow and Inverness or Aberdeen if you wanted to cut down the day tripping travelling time. My my friend owns this apartment in Edinburgh, Susie is really lovely and does her very best to ensure all her guests have a great stay. You don't say what interests you most? Do you think it's worth it? I'm kinda bummed out by the extra fee to visit the castle. My trip will be very short, so I thought this would be a good idea to see as much as possible. When are you visiting and how long for? What sort of things interest you? What's your budget? I will be in Scotland for 5 days and my budget is around 1100$ CAN for two. We will stay in Edimbourg and we already planned a lot of activities in the city. We didn't want to spend all our time driving or sitting in a bus, so a one-day trip formule outside the city was our compromise. Hi @Lau_cean the tour you mentioned above is £60 per head including the castle and boat trip and 12.5 hours ish of being driven around, I would consider that cheap.. I don't think you could do it cheaper using public transport or by hiring a car either. Hi I would like some info about where is best to stay to go on the castle trails. My plan is to take our first trip to Scotland in either June or September - 7 days. Interests are; architecture, history, local culture/food. We want to see a lot but have a day or 2 where we are not travelling. Ideally we would be in one spot but would not mind moving once or twice...especially if we could find a great deal to stay in a castle. Budget $2000 for 2 adults. Can you clarify, is that budget for the whole 7 days and is that USD?! The best area for castles is Royal Deeside / Aberdeenshire with around 300 of them. Even some you can use as a hotel or self catering accommodation. http://www.kpcastlehotel.co.uk - 2 for the price of one stay in the 4* castle hotel overlooking the 13th century castle ruins. OK this one is not a castle - http://www.accorhotels.com/gb/hotel-6626-mercure-aberdeen-ardoe-house-hotel-spa/index.shtml BUT it is castle like in appearance and very grand in terms of delivery. Aberdeenshire is home to a few distilleries (8) and 55 golf courses so there's plenty to see and do outside of the castle spotting! I hope this helps, if I can help any further drop me a message. Hi @melinda I too love history! 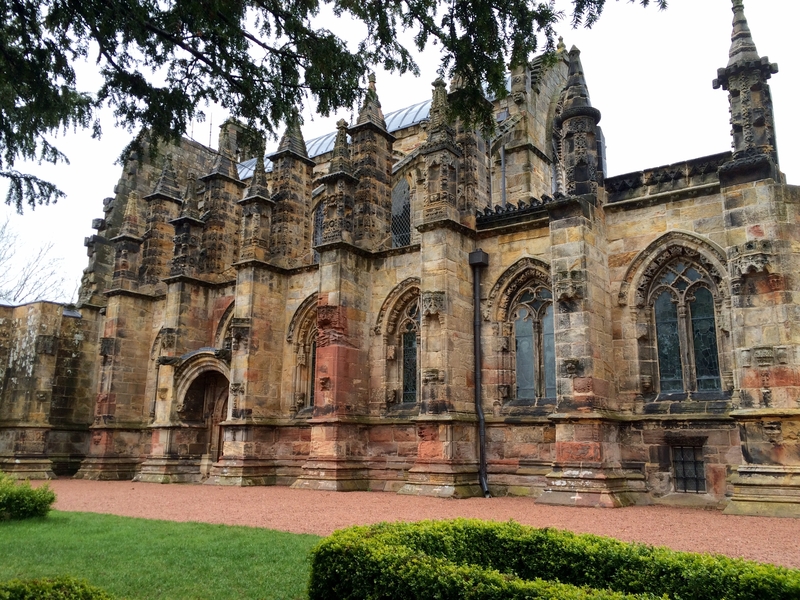 May I suggest after exploring the fabulous city of Edinburgh, head to Rosslyn Chapel just south of Edinburgh in the village of Roslin. It is believed the 600 year old chapel served as a school for stone carvers, hence the extraordinary collection of intricate and varied carvings (it even served as a regiment horse stable during Oliver Cromwell's 1650 raids). The Apprentice's Pillar is everything you've heard it to be, I couldn't stop studying it. There's scarcely an uncarved surface inside the small chapel that took 40 years to complete and was envisioned by William Sinclair, the first Earl of Caithness, to be just part of a massive church. Carvings everywhere - you won't see anything like it elsewhere. The tour guides offer a history-filled talk several times each day. 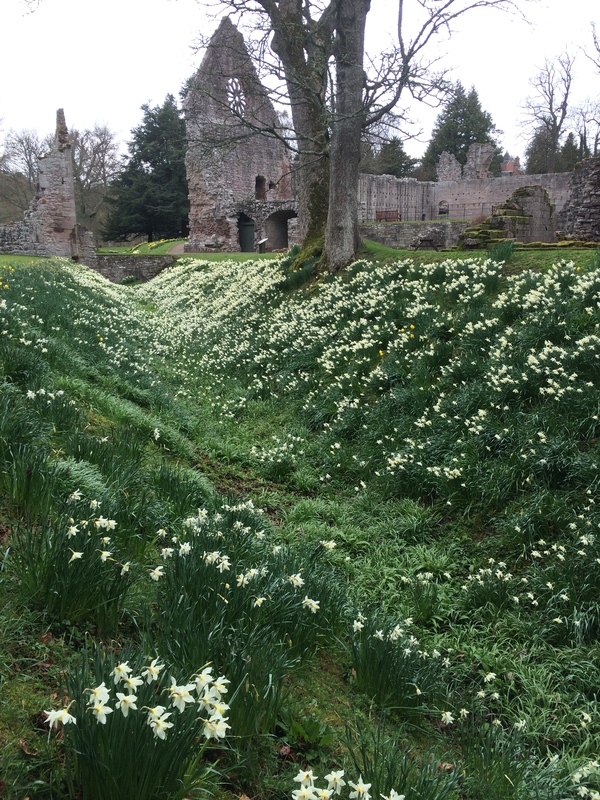 The ruins of Rosslyn Castle are just a few minutes' walk away. 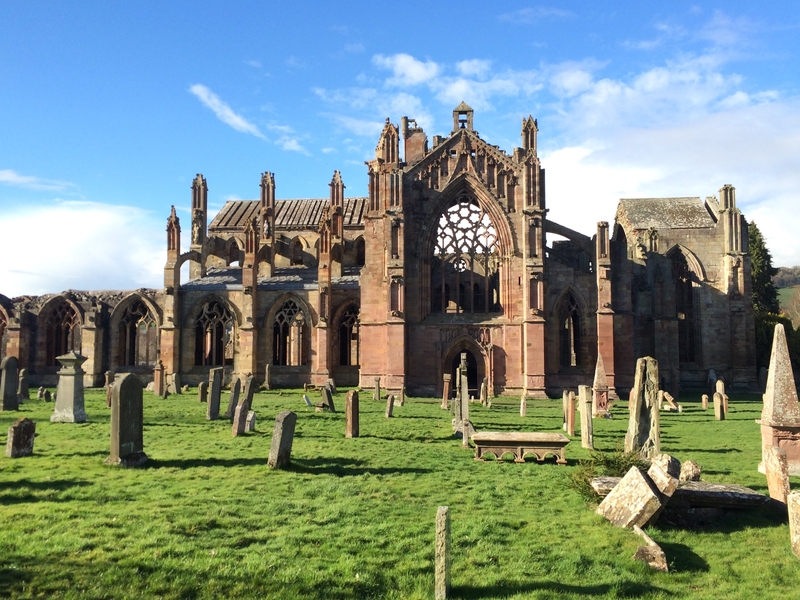 Carrying south toward Galashiels, Melrose, St. Boswells, Kelso and Jedburgh will have you in the heart of the Border Abbeys and the communities above-named. Every history lover should experience these 12th and 14th century abbeys, their massive ruins tell stories of hundreds of years of sacking from English troops and destruction during the Scottish Reformation, perseverance by devout monks seeking to maintain their (not always) peaceful lives. The burying grounds are worthy of a wander, the inscriptions and carvings on the stones are intriguing. There are lovely walks in the area to get your feet busy. You can plan a long one, such as St. Cuthbert's Way and catch a coach back to your starting point; or a shorter section of that particular walk, picking it up at St. Boswells, wandering along the tranquil River Tweed to Dryburgh Abbey, have a wander thru the abbey and its grounds, back along the river until you follow a cutaway route to Newtown St. Boswells, back along the road to finish your 8-10k loop back at St Boswells. You can connect the towns of Melrose and St Boswells and gain some elevation (and views!) up and over the Eildon Hills. You can link the abbeys by car, lovely country driving thru the green, rolling hills of the Scottish Borders. Heading east toward the quaint fishing villages of St Abbs, Eyemouth and Coldingham offers a different history, that of making a living from the sea. The tragic Eyemouth Disaster of 1881 affected several communities, over 125 fishermen lost their lives in a storm. In St Abbs, the bronze statue outside of the visitors' centre pays haunting homage to the widows and children whose men didn't come home. The birdwatching is fantastic along the coast too! Hike up the St Abbs Head if you find yourself there on a good day. 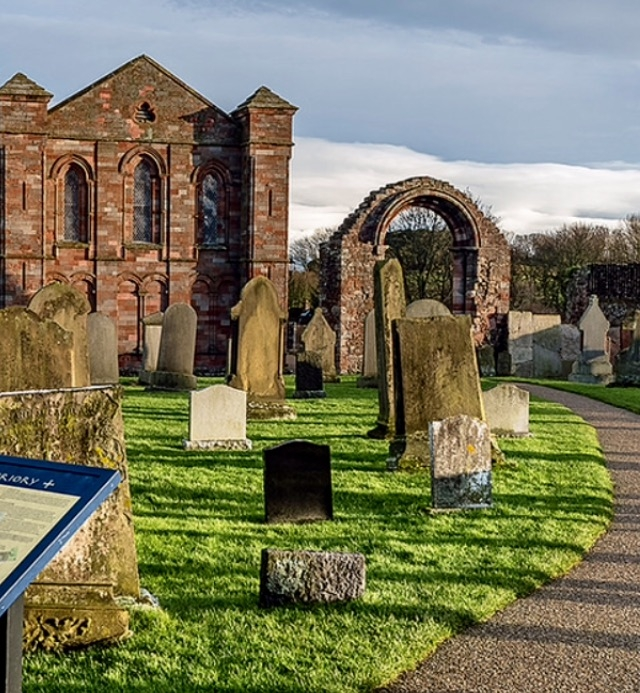 Visit the Coldingham Priory, right in the centre of the village. The site dates back to a monastery in AD 660, the priory started in 1080, it's history marked with conflict during the Reformation, Oliver Cromwell's 1650s raids, some rebuilding, some ruins, the ancient arch and wall of tombstones - all fascinating to wander about. Heading north along the coast brings you to several East Lothian castles including Tantallon Castle, believed to be the last curtain walled medieval castle built in Scotland, as well as Direlton Castle, Innerwick Castle and the Chrighton Castle with its family ties to Mary Queen of Scots. This scenic, now-tranquil, history-filled driving loop brings you back to Edinburgh. The Scottish Borders suffered greatly, being so close to the English border, and it's remarkable that there are Abbey and castle fortresses that still hold their presence after centuries of sacking. I suggest staying three nights in B&Bs or guest houses along the way, there's too much to take in otherwise. North of Edinburgh you can take in a taste of the highlands in the Trossachs, Stirling ...but that's for another post, this one has enough to get you going on your history quest! EDIT added on.... Its hard to take a poor photo with these subjects, but the eight images I included with cut lines aren't showing up after posting ;( I'll give the upload some time, maybe that's all it needs. Other photos I've attached to posts have uploaded smoothly. I'll repost the pics later if they don't appear. The Eildon Hills from above St Boswells village and Dryburgh Abbey. Town of Melrose is on the other side of the hills. Seaside charm, the village of St Abbs, east coast. Coldingham Priory in the village of Coldingham. Hi @Nicolin your budget will depend on what you want to do! I would suggest you need 10-14 days to really get into the spirit of Scotland without a rushed itinerary. 'Budget depends on what you want to do, the quality of accommodation you want and so on! We had a recent three and a half week tour which was very successful. Hello everyone, I have just joined the community and have already browsed some topics, loads of great tips! I'm from Paris France and I am planning to go to Scotland beginning of September with my mom. We are planning to stay between 5-7 days and will be traveling on a budget (retirement & birthday gift all-in-one! ): the idea would be Edinburgh to start with then the Lochs region, Glencoe and a national park at least. I'd love to take her to the Shetlands but I am afraid it would be too pricey and not enough time to get there... what do you think? For the moment, we have a budget of 600 € but I am hoping to get up to 800-900 € by the end of August. We are looking for people to host us as the moment otherwise we will choose to stay at B&B's places. What would you recommend for best transports/ one-day or two-days tours/ must-see etc... ? And what kind of route would you suggest? We'll probably start in Edingburgh, since the nearest airport here in Germany has a direct service to it. After that we will definetly be going North to see some of the breathtaking landscapes I only know from photographs, we were thinking of Inverness as a next stop, Glenncoe, Isle of Skye etc. Any tips (B&Bs, transport, must-sees) ;-)? Thanks so much! The Scottish Borders is a unique region of Scotland, a land of rolling landscapes, astonishing abbeys and babbling rivers. Here's the best of the region - in three days. You'll arrive in Edinburgh at around three o'clock or three-thirty. Take the time to stroll around the city and get some food before boarding a train on the Borders Railway. Get off at Galashiels or Tweedbank. There are hotels and other places to stay in Galashiels, Melrose and Selkirk - buses from Gala's interchange will take you into Selkirk, while a bus typically meets trains at Tweedbank to take passengers to Melrose. From either of the three towns, Abbotsford House is easy to reach - this country home, with its gardens, was the residence of Sir Walter Scott. Stay and have lunch at the café before walking into Tweedbank and catching the X62 bus west to the pretty town of Peebles, where John Buchan wrote The Thirty-Nine Steps. Find out more at the John Buchan Story Museum in the town, or board the 91 bus towards Biggar. You could ask to get off at Dawyck Botanic Gardens and take a look round before boarding the bus back into the town. From the central Borders, journey to Jedburgh. Jedburgh Abbey is the first abbey you'll encounter on your trip, and it's possibly the grandest. If time permits, you can also pop into the Jedburgh Castle & Jail Museum in the town. Another bus will take you back to Melrose. Have lunch at the Greenhouse Café before visiting Melrose Abbey, which dominates the town. The next day, get the train back up to Edinburgh. Consider stopping off at Stow - formerly Stow of Wedale - on the way, a Borders village with its own railway station, a café, and a picturesque packhorse bridge over the river of Gala Water. BUS PROVISO: Getting to Kelso or Jedburgh from the central Borders (i.e. Galashiels or Melrose) may require a change at St Boswells. Buses in the region are almost entirely run by Border Buses (https://www.bordersbuses.co.uk/timetables). Hi there, I am new here and not sure if i am doing this right. We are visiting late May early June Loch Melfort area. Worried about midges and interested in finding nice places to eat and nice places to see wildlife and beachcombing. Can anyone help. First time in Scotland. Thankyou.